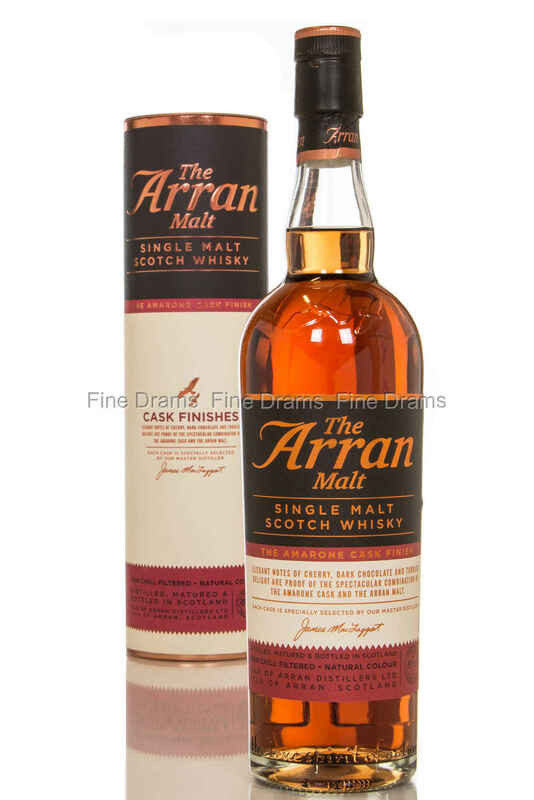 An intriguing and delicious cask finished whisky from the Isle of Arran distillery. This particular whisky was finished in Amarone casks. Amarone is a dry Italian red wine from the region around Verona. Amarone literally translates as “the Great Bitter”, referring to its wonderfully fruity, yet acidic profile. When paired with the naturally cereal-forward, malty and biscuit-y spirit of Arran, this maturation produces an excellent balanced and fruity whisky. Notes of red fruit, grapes, toffee, vanilla, butter toast and chocolate come to the fore, soon joined by flavours of dark oak and sour cherries. A cracking dram, and even better for its warming 50% ABV, natural colour and lack of chill filtration. More impressive stuff from the young Island distillery. Nose: Fresh raspberries and cherries, barley, vermouth, herbs, slight smoke and manuka honey. Palate: Creamy delivery, sweet vermouth, slight soap, grape soda, herbs and botanicals, honey, faintest smoke, red berries, warm malt. Overall: An interesting cask finish with a strong malty core. Reminiscent of a Manhattan. Excellent stuff.